In the 1980's it was touted as the latest corporate game, a way for employees from the same company to spend the weekend competing against each other and, ultimately, bonding together more closely. Now paintballing is a sport for everyone – and older children love it probably more than adults! Paintball is a game where teams compete against each other by eliminating players one by one. This is accomplished through a war-like battle involving paintballs, or small pellets full of paint which explode on contact, covering the player with colour. The game is played until either all the players on one team are eliminated, a flag is captured etc. It can be played indoors or outdoors, and can last anywhere from a matter of minutes to several days. Great for all ages beginning around age 11, it is considered one of the safest contact sports around. Paintball requires three main items: masks to protect players, paintball markers, or guns, and paintballs. With this in mind the game can be played virtually anywhere, although thanks to its inherent messiness, most people prefer to play at commercial paintball parks. The majority of these parks make their money by offering paintball with a specific theme, either a military field, city setting, jungle etc. While you can just play outside on any old field, be advised that most injuries occur where there is no set instruction and regimented setting. Indoor paintball parks also exist for inclement weather. Many companies offer paintball experiences which are very good value for money, and many offer special prices for children aged 11 - 17. Some offer admission to a park, full paintball gear and a hot lunch for £25 – for two people. Insurance is also included, important to know when doing this type of sport. For the more adventurous – and wealthier – there are more complicated paintball days available. Some, like Tank Paintballing, which involves driving in a tank as you try to eliminate opponents with your paintball gun. Great if your kids have a strong militaristic streak – and you have £79! 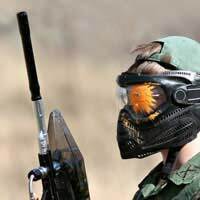 Alternatively, some parents prefer to host a paintball party, which in effect kills two birds with one stone Look online to see what type of parties are available – most will theme the event to suit both your interests and the ages of your children. Having your children get dressed up in military gear and shoot their friends is not a sport for everyone. There are both sides to the story. Only you can decide whether paintball is a game suitable for your children. There is no doubt that it can be a fun physical activity played in the fresh air. And there's no doubt that it will stop your children from getting bored on a bright sunny summer's day.